Earlier this month our beloved country celebrated its 238th birthday. Our country has grown a great deal since back then, and there once was a time where the Western frontier was unknown territory. That was until Thomas Jefferson commissioned Meriwether Lewis and William Clark to travel west and study everything they saw. From May 1804 until September 1806 Lewis and Clark traveled from St. Louis to the Pacific Ocean, in what is now Oregon, and back. Now anyone that has ever played the computer game Oregon Trail in Elementary School knows that this was a dangerous trip,(whoever has died in Oregon Trail from Dysentery raise your hand, there’s no shame) with unknown trials and tribulations. 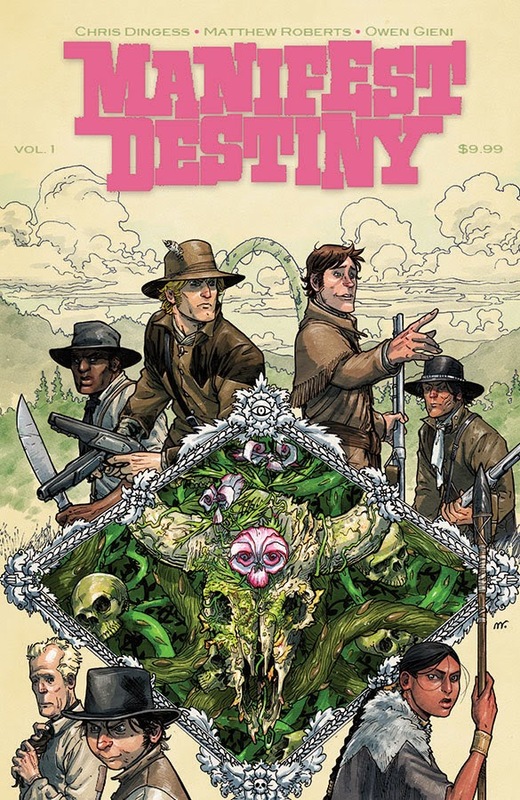 Manifest Destiny by Chris Dingess and Matthew Roberts asks the question; “What if there were unknown horrors added to the trials and tribulations of this expedition?” The answer is you get a freaking good comic. 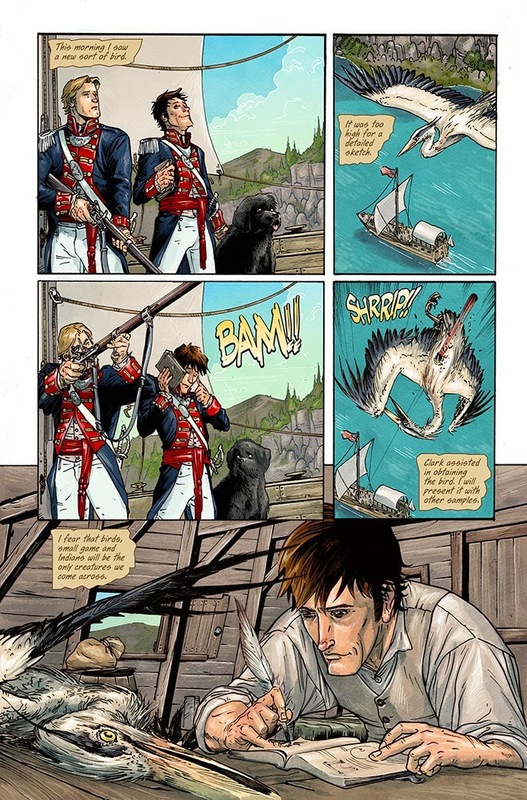 This Volume of the book started out with our heroes Lewis and Clark and the rest of their expedition traveling to a fort to rendezvous with their guide, Sacagawea, who seems to be more than meets the eye. 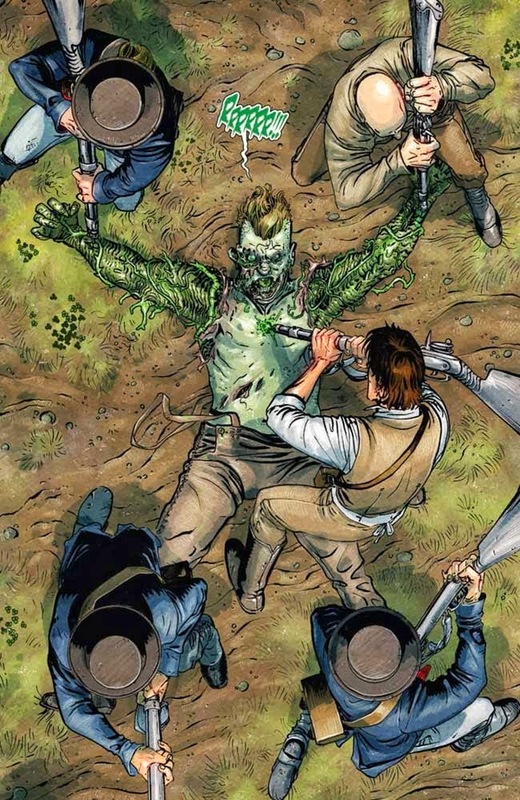 But on the way to this meeting the group is first attacked by large buffalo headed monsters and once they escape that danger by the skin of their teeth they stumble onto a fort that has lost the majority of their population to a disease that turns its victims into plant zombies. 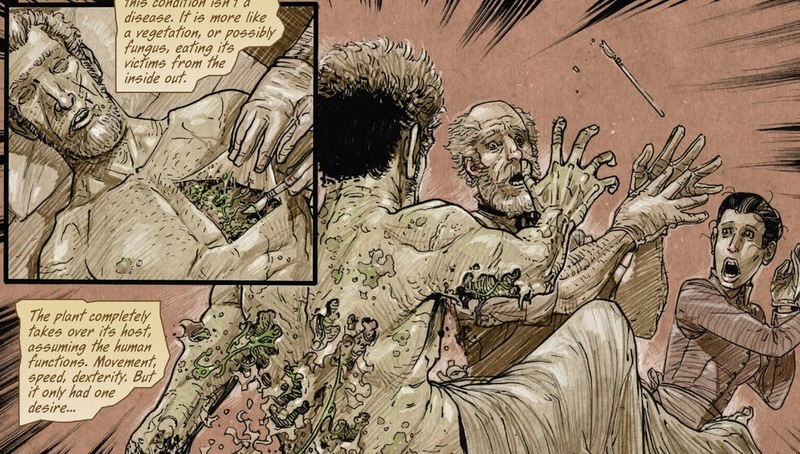 That’s right this book first hits you with buffalo headed monsters and then follows that up with a solid dose of plant zombies, if you need more than that to rope you in to this series I don’t know what to tell you. Matthew Roberts’s artwork is amazing and he paints a lush scene of the country’s woodlands and the beauty of the frontier. There is plenty of intrigue and questions that this initial volume introduces and I am patiently waiting for the next volume. 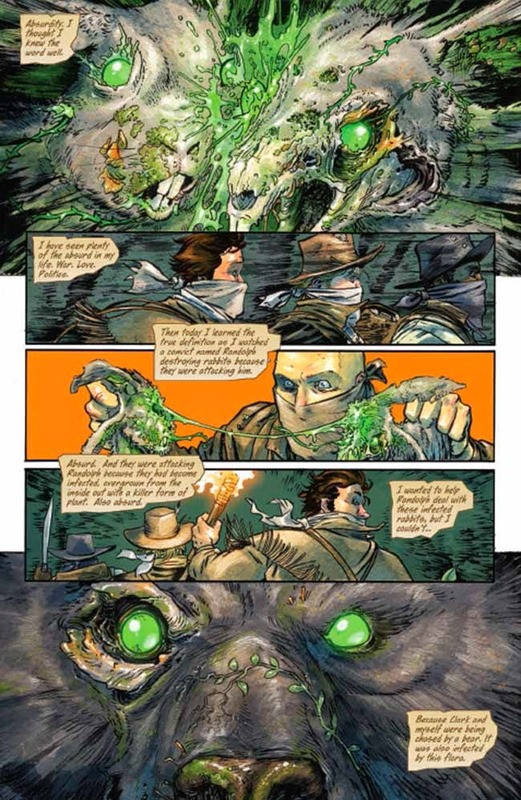 Now I came across this comic in an interesting way, it was recommended to me by the owner of my local comic shop, StormWatch Comics. I cannot stress enough the importance of your local comic shop. The people in there can point you to some very interesting reading material if you ask them, stuff you might not have given a second look at otherwise. 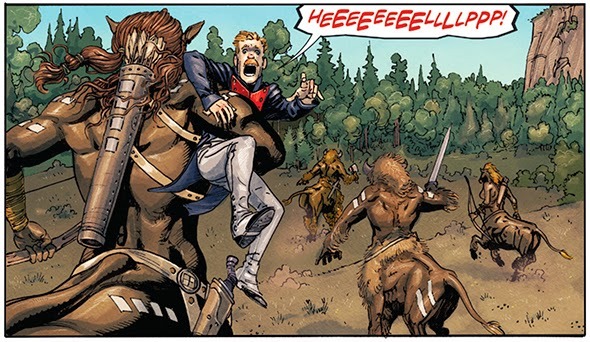 The people at my comic shop have never steered me wrong and have introduced me to some great books and series so if the people at your shop are pretty cool let them point you to something, you might find a new series to love. I’m also always looking for new graphic novels to pick up so leave me your suggestions in the comments. 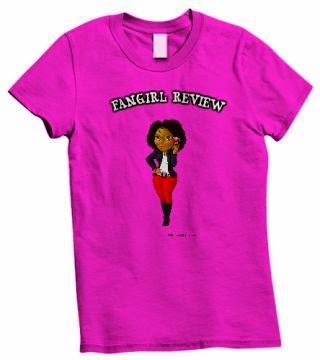 We also have a contest going on for our one year anniversary so head on over to the post right here: http://www.fangirlreview.com/2014/07/fangirls-1-year-anniversary-contest.html#.U9ISdbHJDzM and enter to win. Within our recent design contemporary society, as being a individual includes becoming tracked. Tracking has developed into key component of our every day lifestyles and is precisely the powerplant that will drive our educational course of action for your foreseeable future. custom writing www.grabmypaper.com is best one and really awesome custom essay writing service providers. I've read your post. Obviously, it's informative. But the format you scratch here is diverse from the artists biography service although they claim them-selves as expert artists bio writer.